I'm writing this from 30,000 feet, somewhere over Nevada, unless it's Utah by now. That's the only thing I don't like about viewing the world from up here--not knowing just where I am. (There are plenty of things I don't like about flying, but I do like the view). This morning, leaving SF just after sunrise, flying above the thick fog that (naturally) enveloped the Bay was a lesson in meteorology and air currents. The highest points stuck up through the clouds, and in some cases appeared to have created a wake as though moving through the glutinous fluff. At the edge of the East Bay hills, the fog curls under like a carpet meeting the wall, evaporating as it fights the losing battle against the dryness as the air rises over the hills. Crossing the Central Valley showcased the flatness of that feature--and the abrupt unexpectedness of the Sutter Buttes, a leftover volcanic feature that is the only thing to break the smooth flatness for many miles in all directions. Tahoe). But the crossing of Nevada leaves me in no doubt about what "basin and range" means, geographically speaking. Nicely aligned rows of mountain ranges alternate with dry valleys, occasionally relieved by little round patches of irrigated green--some rancher's alfalfa field. I'd almost forgotten what it was to be excited about looking out the window. We all try so hard to be cool and sophisticated, but sometimes it's worth reverting to childhood and bouncing a little with excitement as the world unfolds before us. On another note: I'm headed out backpacking, so the blog will fall silent for about 10 days. See you in August! Wow, a little late-evening storm activity has temperatures here finally dropping, and a lovely wind blowing in my window. It makes the blinds flap, but who needs 'em? Raise 'em out of the way and let the breezes blow! Oh, yeah. I was here to post up a review of an interesting and entertaining read. . . Your Mileage May Vary, by Kristine Goad. I was intrigued when I heard about Kristine Goad's memoir of her participation in the first American Lung Association Big Ride Across America. I'm a sucker for tales of long trips and outdoor activities--journals of hiking the PCT, trips to far places in Alaska, or crazy bike rides (see review of Mud, Sweat and Gears). As soon as I read her blurb, I realized this wasn't quite the same sort of book, but I was still intrigued. How did a 29-year-old, overweight, asthmatic, novice rider ever get the idea to ride across America--and how did she manage to make it any distance at all? Ms. Goad is completely upfront with this. In her words, "it is the story of one wildly imperfect, novice cyclist facing more than just the challenges of the road. . . . you should expect to endure a measure of whining as well as a good dose of tears, bouts of irrational or overblown fear, and more than a few questionable decisions." She doesn't exaggerate, except perhaps about the whining (she reports some, but the book itself does not whine). I enjoyed the story a great deal, from the first, frightened pedal strokes out of Seattle (Ms. Goad, it turns out, having so little experience with riding, has to deal not only with her fear of bridges, but also with a great fear of riding in traffic). When she has to give up on the climb over Snoqualmie Pass, I feel her disappointment, and accept the warning she's already given: not the heroic story of a woman who rides every mile, but rather the actual story of a woman who rides as much as she is able, physically and mentally. She is very hard on herself in many ways when her asthma sidelines her for days at a time, but I cannot imagine even getting up in the morning feeling that way. Learn to pee in the woods. There isn't always going to be an outhouse where you need it. Use tire liners, but still learn how to change a flat before leaving home. Practice. Ms. Goad experienced an inordinate number of flats, which surprised me as I get so few. Tire liners make a huge difference (and yes, they were out there in 1998 when she rode. No one thought to suggest them, apparently). Get decent camping gear. She was sleeping directly on the ground in a tent that couldn't keep out the rain. Use a pad, get a tent that can stand up to high winds. In 48 nights and over the mountains and across the prairies, there is bound to be some interesting weather. Learn to ride comfortably in all kinds of conditions (weather and traffic). Test your gear and clothing. This one I'd never have thought of, but YMMV makes it pretty clear: have plenty of money. The riders had a lot of fuel expenses (i.e. food. What else would a bike run on? ), not to mention laundry and occasional entertainment. Ultimately, I admired the author for doing the ride. Ironically, being more accustomed to biking, and having experience with riding Centuries, I would probably say that I am by no means fit enough to take on a ride like that, and wouldn't even start. Sometimes, ignorance is your friend, though it's pretty clear at times it didn't look like it to her. But the lessons she learned, about herself, about being fit, and about group events, prove that she was right and I would be wrong: it is worth doing, even if you can't ride every inch of the way. 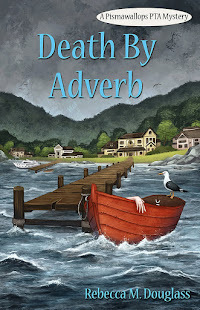 Ms. Goad's writing is engaging and generally smooth and well-edited. I'm giving this one 4.5 stars. I drove the spouse to Denver International this morning at a fairly unholy hour. The glorious thing about unholy hours, though, is that they are the most beautiful. We saw the sun rise over the prairie (far to the north, as it's still not that far from the solstice, which made it nice--the sun wasn't in my eyes as I drove). Too bad the mountains were behind us, so I couldn't really check out the morning light on them. By the time I turned around, the sun had been up for over half an hour and the light had lost its magic. A dozen or so years ago, they built the new Denver airport a gazillion miles out from town, far out on the prairie. In part, Nis was to keep the aircraft noise away from the residential neighborhoods. The inevitable is gradually happening, though. It used to be that you didn't see a thing after leaving I-70 all the way out the ten miles to the airport. Now, housing developments line the first few miles. Eventually, no doubt, people will be complaining about the noise of the airport. I do love the first sight of DIA as you approach. The funky faux-teepee roof (or is it the Rocky Mountains? I think it's meant to be both) ought to be dated and tacky, and maybe it is, but it still works for me. At least it's not just another industrial building. I'll take my beauty where I find it. Now, if only I could find the beauty in the stubbornly plugged toilet that waited for me back home! Okay, I've been loving the Discworld novels, but I really feel that Pratchett is starting to hit his stride with this one. 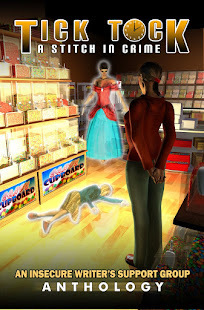 What happens when Death seeks an apprentice? It may be that only Pratchett would think to ask, and even more likely that only he would come up with an answer that makes me and my 13 year old both laugh aloud (though not necessarily at the same bits. It may be best not to know sometimes). If The Colour of Magic reminded me a lot of Douglas Adams, with Rincewind about as much in control of his destiny as Arthur Dent, Mort is more intentional and funnier, even while it has a darkish theme (though less dark than you might expect with Death as a main character). The lead character, Mort, becomes Death's apprentice by chance and default, but he is not content just to be blown by the winds of fate. He struggles from the beginning to take control of his destiny, and if he screws it up big time (nearly destroying the world, or possibly the universe, in the process), he does it with a reasonable idea of the outcome he wants. And when fate seems to be overcoming his desires, he pulls out an impressive amount of will-power to remain his own man. Mort's love-life is perhaps the least convincing aspect of the story, yet even that feels to me very real--he's a teen, with limited ideas about what love should look like. I won't say more on that subject lest I offer a spoiler. (Note to self: ask teen sons what they thought of the romance. If they noticed it.) I gave the book four stars because I save five for perfection, and I think Pratchett will get there. But I'd make it 4.5 if I could. Recommended for readers who like humor, from about age 12 up. 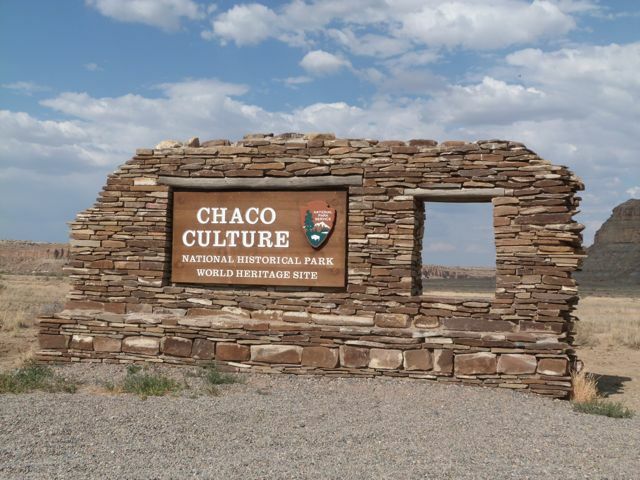 Welcome to the land of the Anasazi, the People Who Came Before. It's not a terribly hospitable land, not in mid-summer. Mid-day temperatures hit the triple-digits, and we retreat to our air-conditioned car. 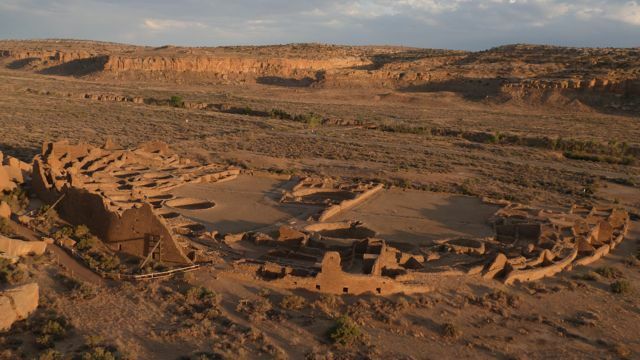 Chaco Canyon seems a most unlikely place to build a civilization. Yet, from about 800 to 1300 AD, the Anasazi did just that. 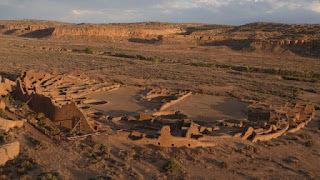 They built modest villages, but mostly in Chaco they built giant "Great Houses" that seem to have served mostly a ceremonial purpose. 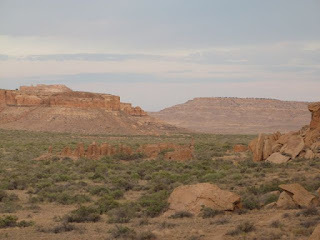 Today we can wander through the broken remnants of some (carefully excavated and stabilized by the Park Service), trying to imagine what it was like to live there when the canyon was full of people. Unless, of course, it wasn't full of people. 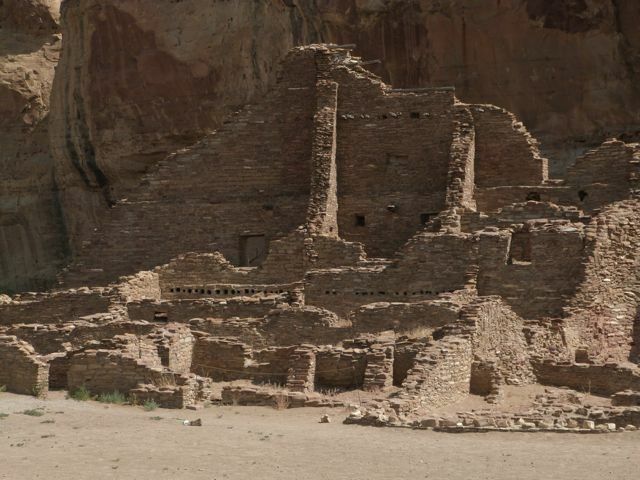 Archeologists try to figure out what went on there, and now figure maybe only a few hundred people lived in the canyon year-around. Never mind. At times the place must have been swarming with crowds, if only because it took a lot of people and a lot of effort to build the Great Houses, up to five stories high, one rock at a time. We arrive in the mid-afternoon, when the sun is still too high to do anything but seek the shade. Chaco Culture National Historical Park is run by the NPS, which did a nice job with the sign at the entrance! (This after 20 miles of dirt road). They had good stuff to model it on. 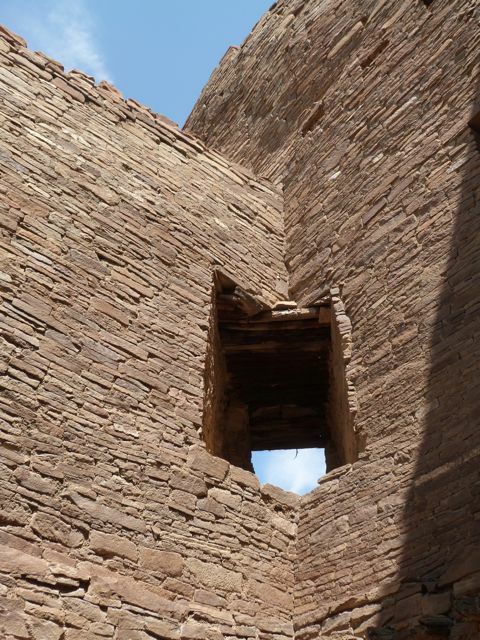 This is the tallest remaining section of the best preserved (and reconstructed) building in the Canyon, Pueblo Bonito. You can see the round holes near the bottom where the roof beams went in (as well as the stubs of a few beams near the top). Not all the architecture was simple, either. These corner doorways led from room to room, back when there were floors and ceilings. They might have been significant--they didn't use them in very many places. It's not the most hospitable land, but looking at Wijiji in the early light, I have to say it is a setting for those who like the scenery. Maybe that was part of the draw? 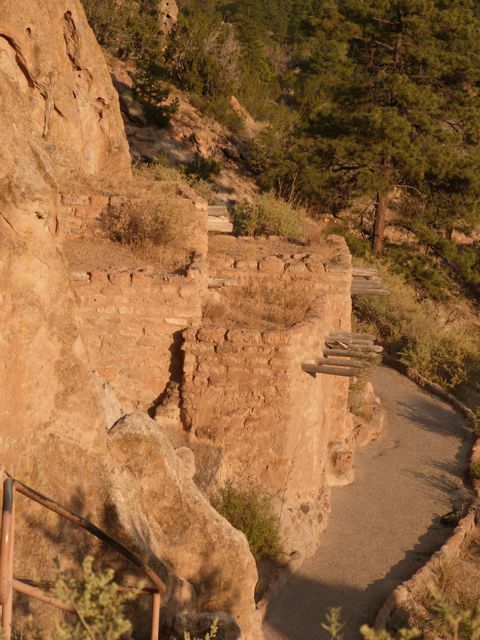 The scope of Pueblo Bonito is best seen from the canyon rim at sunset. The "D" shape with a courtyard (or two, in this case) seems to have been a standard form. 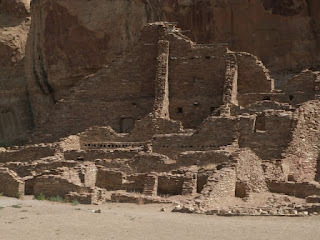 Since the Anasazi didn't have writing, our knowledge of what they were up to is pretty limited, and largely drawn from the traditions of their descendents, the Hopi and Pueblo peoples of the region. One thing we do know, is that styles and locations changed over time. 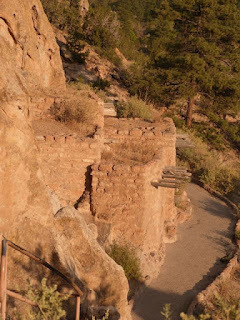 Bandelier National Monument, near Los Alamos, New Mexico, is a much later settlement and seems to be in a distinctly more hospitable setting (though there were nearby houses and villages atop a mesa, with neither water nor farmland--what were they doing up there?). The Canyon sports a year-round creek, which flows to the Rio Grande (perpendicular canyon in the distance). You can see the remnants of a large, circular house or village in the clearing. 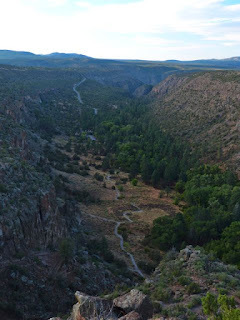 But in Frijoles Canyon [corrected from original. Bandelier Nat. Mon., but Frijoles Canyon], the Anasazi also had natural shelter. 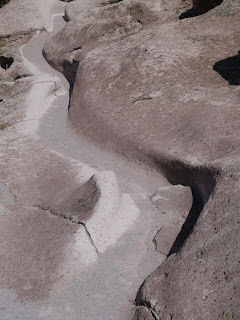 The volcanic tuff that makes up the canyon walls is soft and ends up looking like Swiss cheese. They built houses up against the cliffs and made use of the natural spaces as well. 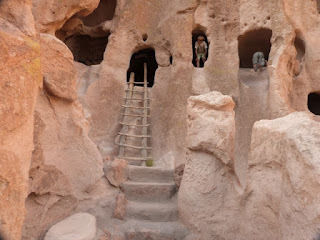 You can tell by the round holes above the cave openings that there were houses in front--those holes held roof beams. 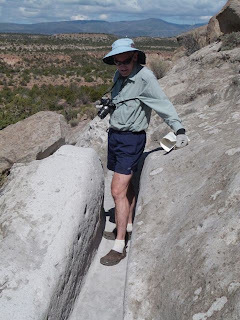 One last photo perhaps best captures my sense in these places of walking where the ancients went before. On Tsankawi Mesa, the paths themselves were worn deep into the rock by hundreds (or thousands?) of feet over time. Summer is here, the kids are out of school, and as usual, it's making it hard for me to do what I do. Schedules go all to bits, and there are guys all over my house! Two teen sons and their dad (who teaches at the University, so doesn't have to go to the office every day in the summer. Later, he'll get back to work, but right now he's definitely recovering from the term) seem to take up all the space--and all the computers. Ultimately, you know what's worst about this sense that summer vacation is messing with my work and my neat little life? Losing that feeling of euphoria that the end of school gave me for (adding. Adding some more. Still adding) something like 27 years.